Since the first of the year I’ve been spending a lot of time in the wood room. Cutting, glueing, nailing and creating all kinds of awesome (check out my instagram you’ll see what I’m talking about!). 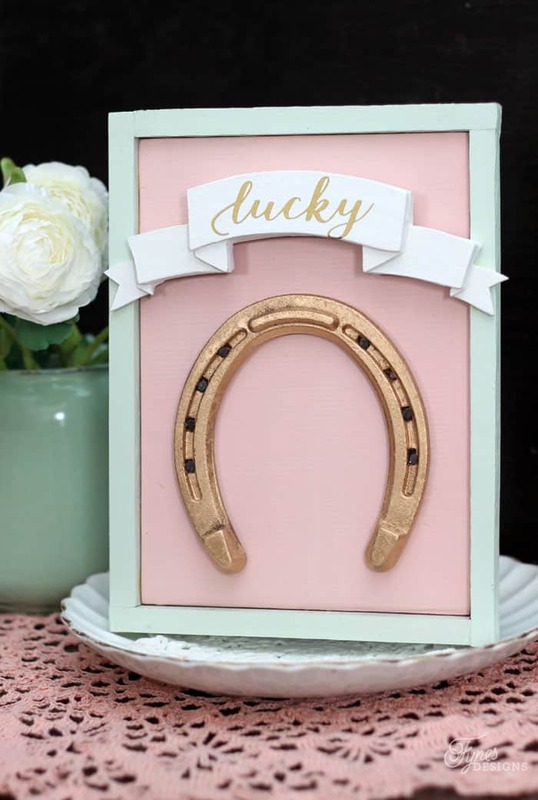 Today I have one of my new favourite signs to share, a Lucky Gold Horseshoe Sign. I thought this was quite fitting to share this little painted sign being March and all the luck floating around, and St. Patrick’s Day in only a few days. 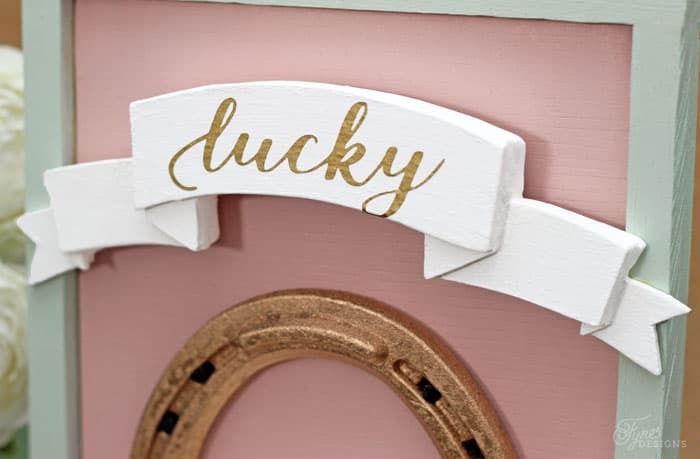 I found inspiration for this Lucky Gold Horseshoe Sign from a wedding suite I seen on Instagram from Events In The City (you have to check out all their beautiful weddings and events). The colors were beautiful and I had some horseshoes lying around from when I created a Lucky Pallet Sign and an Irish Clover Sign a while back. 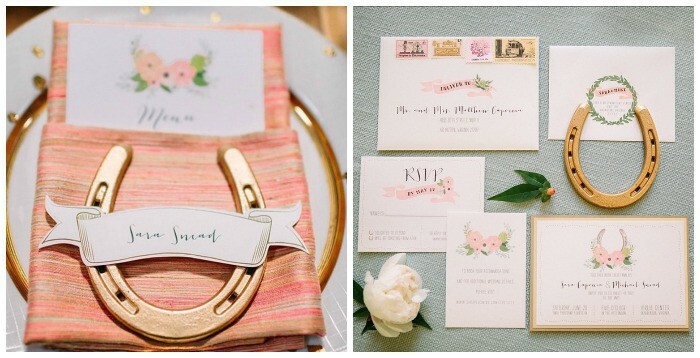 Isn’t the place setting so pretty?! I loved the idea of using a banner on my sign, but didn’t think a paper or ribbon one would quite work with the dimension and weight of the horseshoe. So I cut one out with my handy dandy scroll saw. The banner is made up of 5 different banners layered on top of one another. I filled in the edges with filler and applied a coat of paint. I cut out the ‘lucky’ using the Silhouette and gold vinyl. It looks much neater than if I had tried to paint it. 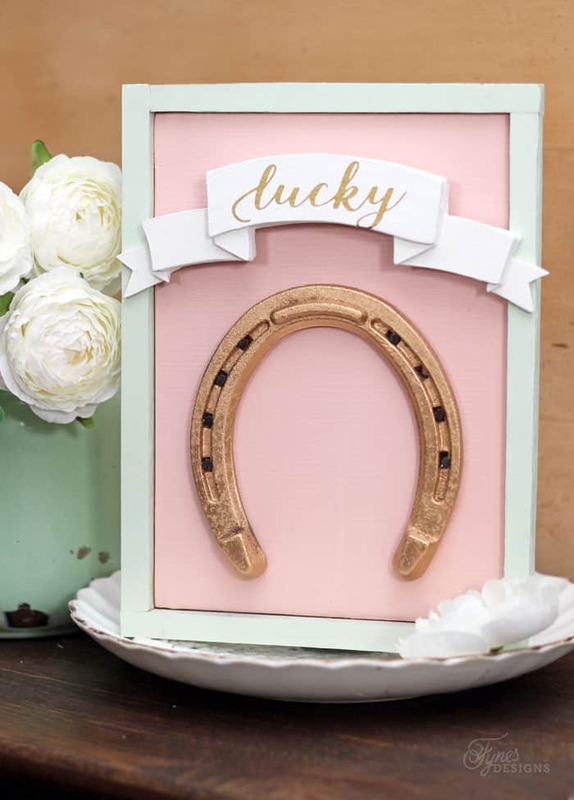 I’m in love with my new Lucky Gold Horseshoe Sign, a pretty little St. Pat’s decoration that will last throughout the seasons. Plus give you a reminder to be thankful for all the lucky little things in your life! Why do you feel lucky? 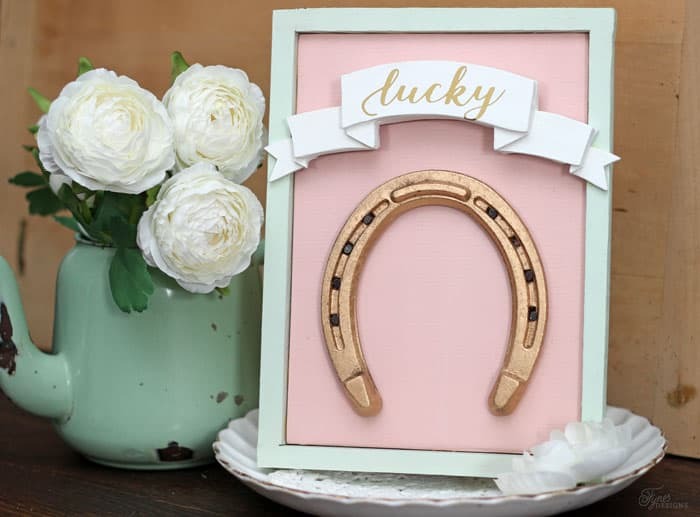 You’re sign is lovely, but shouldn’t the horseshoe be turned with the open side up, so the luck doesn’t run out? Ha, thats a good Point Carol! I’ll have to remember that for next time, thanks for pointing that out! I love this, Virginia! As a former horse-girl, this sings to my heart! I want a scroll saw. Is that banner just pieces of wood cut and glued together? Yes, just cut and glued together, I love the dimension it adds!